Most point and shoot cameras have a special “macro” mode that allows the lens to focus at a much closer distance. This helps you fill the frame with smaller flowers, and create a more out of focus background (remember the three things that affect depth of field). Another thing you can do to create a more out of focus background is maximize the zoom on your lens. Make sure you only use optical zoom though. The digital zoom on point and shoot cameras is really just a poor digital interpolation that will likely degrade the quality of your photo. If you’re in a shaded area, your camera may want to fire the flash if it’s set to auto (the default on most cameras). But, the flash could ruin wildflower photos by creating that weird artificial light look and casting harsh shadows. So, remember to turn off the flash. Unlike SLRs, point and shoot cameras usually have very poor performance at high ISOs, so to avoid getting super noisy images, make sure you’re shooting at the lowest possible ISO value of your camera. Overcast or cloudy skies will help create the perfect lighting conditions for photographing wildflowers. The clouds act as a natural light diffuser that balances the light on the flower (preventing blown highlights and harsh shadows that you’d experience on a bright sunny day). If you can’t wait for an overcast day, or they rarely occur in your area, you can also make an artificial light diffuser that also works quite well. The background plays an important role in wildflower portraits: it helps draw attention to the main subject, the flower. So, look for a flower that has a background that not only contrasts well with the flower, but is also far away (5 ft or more). The farther away the background is, the better: this will dramatically help you get that out of focus background on a point and shoot camera. To help increase your chances of getting a sharp photo, remember to take more than one shot. Even on a seemingly calm day, flowers can be seen bouncing frantically through the air. Taking a couple shots will help ensure you photographed the flower when it was still. There’s always creatures that like to eat flowers, so spend some time looking for one that’s in good shape (e.g. not missing petals). 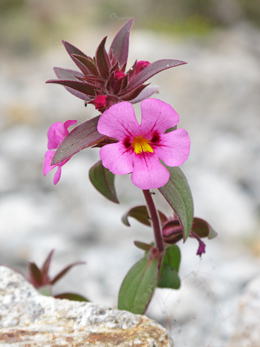 Some flowers are also more saturated than others of the same species, so be on the lookout for these gems. #10 – A light weight tripod such as a Gorillapod is wonderful tool to have around when you’re shooting with a P&S since they can easily support the camera and can be bent or twisted into just about any shape desired. #11 – Use the self-timer if your P&S has one. This has two benefits (1) allows you to position a diffuser if you’re using one and shooting alone and (2) reduces the possibility of camera shake which could lead to a blurry image. Thanks alot! Your tips were extremly helpful! Thanks for these wonderful tips on photographing Wildflowers. I have taken a few pictures of wild flowers and have been pretty lucky. I will put these tips to good use with the Spring flowers popping their little heads up no. I know this probably sounds strange, but I am going to practice with some artificial flowers that I have in the spare bedroom to get a better handle on closeness and using my tripod.